The film is a multi-year road trip to intercept the Striped Bass migration from The remote beaches of the Chesapeake Bay in Virginia through New Jersey's famed shore, to Rhode Island, night hunting in New York City, & a day on the flats in The Hamptons, to the rocky surf of Montauk, the sparkling islands of Martha's Vineyard and Nantucket off of Massachusetts & up to the white sand flats of Maine. 3 parts: DVD, Spring, Summer and Fall, 2:44 min. 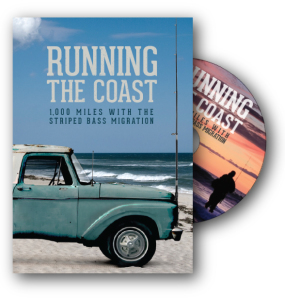 The mayhem & magic of the striped bass migration can now all be seen in this three-part miniseries (Spring, Summer and Fall) together on one disc. The DVD follows the migration from Virginia to Maine in all conditions. Special features with new content including: inside surf guru Bill Wetzel's surf bag, Bob Popovics on-site beach tie of his famous hollow fly, Paul Dixon tying an epoxy fly for the flats, behind the scenes with world record holder Greg Myerson and friends, plus a memorable marina poem after the blitz with Pink Floyd's Roger Waters. After 5 years, its all yours. Conventional World Record Holder Greg Myerson makes the boat shake with both his enthusiasm and his fish catches. His innovations are changing the sport. Along the way we fish with a cast of characters who share a passion with both fly rods and conventional that goes from shallow water to offshore shoals. All is catch and release, and all are sleep deprived and love every minute of it. This is guaranteed to make your heart race and to fall in love with the striped bass all over again. It's struggles to maintain a health number are a theme of the movie and every sport angler will appreciate it.